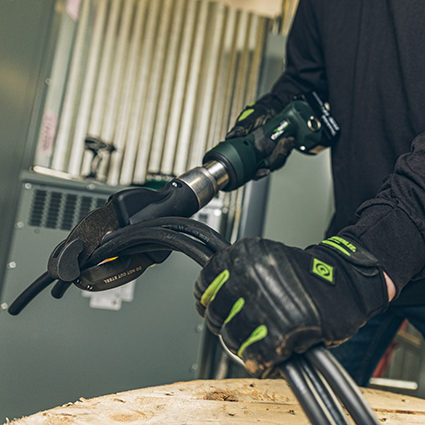 The ESC50LX is the newest addition to Greenlee’s Gator tool family, which encompasses hydraulic battery powered cable cutters, crimpers, and knockout drivers. The cutter is powered by the 18V Lithium-Ion 4.0 AH Makita® Battery platform. The body of the tool includes a molded tacky grip, designed with a smaller diameter, making the tool easier and more comfortable to use. The ESC50LX features a 350-degree rotating head to cut at any angle and programmable double-click blade activation safety option to prevent the jaws from unintentional cutting. The tool provides excellent durability with its enclosed housing and coated circuit boards protect against water and dirt. Greenlee’s Gator tools include smart features. The OLED Display real-time communication and tool maintenance status. In addition, the Bluetooth® feature is enabled via the Gator Eye® application so the operator can obtain real-time tool performance feedback on a smart device.